THE speaker of the Perak state assembly is indeed an interesting character. Tronoh state assemblyman V. Sivakumar from the DAP made history by becoming the first Indian to be elected speaker of a legislative assembly in Malaysia. In fact, his name did not make headlines until recently. In June last year, Sungai Rapat assemblywoman Hamidah Osman had to apologise and retract her derogatory remark when she asked if Sivakumar would "agree to disagree" with the well-known fable of whether a snake or a man from a particular race should be killed first. This insensitive remark also caused the Perak Umno and Barisan Nasional to later apologise to the Indian community who felt offended by it. But Hamidah was not referred to the Committee of Special Privileges. 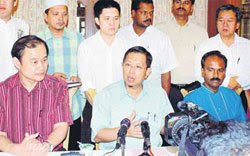 Instead, last Wednesday, the committee, chaired by Sivakumar, summoned Menteri Besar Datuk Dr Zambry Abdul Kadir and his six executive councillors to appear before it over a complaint made by Canning assemblyman Wong Kah Woh that Zambry and the six exco members had shown contempt for the house allegedly by getting themselves appointed to their positions. After a meeting which lasted only about 30 minutes, Sivakumar announced that Zambry had been barred from attending assembly sittings for 18 months. The six exco members were barred for 12 months. Interestingly, just four days before the meeting, Sivakumar was reported to have said at a press conference that the purpose of the meeting was to gather information and compile a report. He added that the report would then be presented when the house sits, and it would then be up to the house to decide on the actions to be taken. This is consistent with the Perak state assembly's Standing Orders 72 and 78 which expressly require the report of the committee to be tabled in the legislative assembly for approval and adoption. I find Sivakumar's behaviour in the entire affair since the fall of the Pakatan Rakyat state government rather bizarre. It is a well-known convention that a speaker must be politically neutral. In England, as soon as the speaker is elected, he has to resign from his political party and stay away from political issues. Political impartiality of the speaker is implied in article 44(3) of the Perak state constitution which provides that the speaker is not entitled to vote unless it is necessary to avoid an equality of votes. While it is understandable that a speaker within our Malaysian context will make procedural rulings in favour of his own party, Sivakumar's conduct, especially outside the proceedings of the assembly, can only be described as disturbing. He played an active part politically the very moment news broke that Jamaluddin Mat Radzi and Mohd Osman Mohd Jailu had decided to become independents. First, Sivakumar allegedly said the undated letters of resignation were faxed to his home. Later, he allegedly corrected himself by saying the letters were actually hand-delivered by some unknown persons. He was on television to announce that the two assemblymen had vacated their seats, not alone from the speaker's office but at a press conference flanked by the previous executive councillors. He also announced that the two independents had been barred from attending the sittings of the assembly prior to the sultan's decision to appoint Zambry, making it near impossible for a full assembly to be convened to take a vote of confidence on Datuk Seri Mohammad Nizar Jamaluddin. Hence, I am surprised that, having played such an active role, it did not cross his mind at all that it would be wrong for him to either chair or attend the committee of special privileges hearing against Zambry and his exco members. This goes against one of the fundamental rules of natural justice -- nemo judex in causa sua which means no one should be a judge in his own cause. To hold that Zambry and the others are in contempt of the house by getting appointed is as good as saying the sultan is also in contempt by appointing them. Based on this ground alone, the validity of the suspension decision of the committee can be challenged. This is not prohibited by Article 72(1) of the Federal Constitution which reads: "The validity of any proceedings in the legislative assembly of any state shall not be questioned in any court." Under Article 160(2) of the Federal Constitution, "legislative assembly" as defined does not include any of its committees. While Sivakumar may be insulated from any proceedings in any court in respect of anything said or any vote given by him when taking part in proceedings of the committee under Article 72(2) of the Federal Constitution, Article 72(1) clearly does not exclude any proceedings of any committee of the legislative assembly from judicial scrutiny because unlike Article 72(2), Article 72(1) does not contain the words "or any committee thereof". Further, the counterpart provision for Parliament is Article 63(1) of the Federal Constitution and this article, unlike Article 72(1), expressly provides that the validity of any proceedings in either house of Parliament "or any committee thereof" shall not be questioned in any court. In this respect, the Supreme Court in the majority decision of Haji Salleh Jafaruddin v Datuk Celestine Ujang & Ors 1986 deliberately left open the question whether Article 72(1) applied to proceedings in the committee of privileges of a state assembly. Judge Mohamed Azmi also opined that should the words "any proceedings" in Article 72(1) arise for determination in future, perhaps a panel of more than three judges of the apex court should consider whether the court's power is exercisable in respect of quasi-judicial or even administrative proceedings of the state legislative assembly or its committee, as distinguished from its legislative proceedings, having regard to the doctrine of separation of powers. It follows that whether this matter is brought to the courts or not, the assembly should be immediately convened without barring any elected representative to discuss the suspension order and to enable a vote of confidence on the government to be taken. Otherwise, fresh elections should be held in order not to prolong the political instability which is bad for both Perak as well as the country. To quote the 15th American president, James Buchanan, "the ballot box is the surest arbiter of disputes among free men".